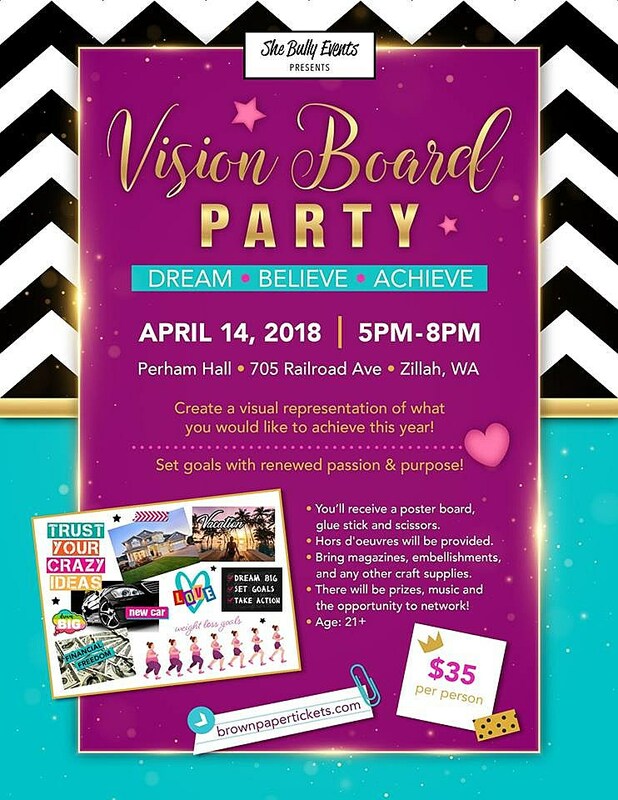 Time's running short to sign up for this Saturday's (April 14) vision board party at Perham Hall in Zillah. She Bully Events is playing host, and they're looking for visionaries like you who are ready to be inspired to turn their ideas into action. The 21-and-over party will be an empowering and uplifting evening of crafting and discussions -- the perfect place to dream big and create visual representations of what you'd like to achieve this year. So bring along whatever inspires you. Pictures, quotes -- anything that will renew your passion, refine your purpose and help you make this your best year yet. The party lasts from 5-8 p.m. at Perham Hall in the Old Warehouse, 705 Railroad Ave., Zillah. There'll also be hors oeuvres and a few other special surprises. Tickets are still available at brownpapertickets.com -- and here's an extra copy of the event flier. It's time to dream, believe, achieve!